Firefighters have spent a second night tackling a large forest fire in East Ayrshire. The emergency services were alerted to the blaze on a hillside at Loch Doon at about 18:50 on Saturday. 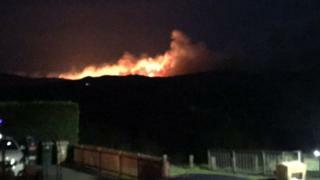 At least five miles of hillside has been affected and the public have been asked to avoid the area. East Ayrshire Council said overnight that “progress” was being made and that a welfare centre had been opened in the nearby town of Dalmellington. Fire crews have been working in the area with support from Police Scotland and Forestry Commission Scotland. They are expected to remain at the scene monitoring the site and managing hot spot areas. The cause of the outbreak is still under investigation but the Scottish Fire and Rescue Service (SFRS) said recent dry weather has heightened the wildfire risk. A number of other fires broke out over the weekend, including one near Paul’s Hill wind farm near Ballingdalloch.